Set in the turbulent, colorful 1970’s, What We Set In Motion finds the daughter of a prominent old South Carolina Lowcountry family fleeing to New York’s Greenwich Village in pursuit of a dance career. Cut off by her disapproving father and abandoned by her would-be fiancé, Nadine Carter Barnwell must strive on her own to beat the harrowing odds. Penniless and surrounded by the temptation of dubious money-making schemes and the bitter disappointment of seeing a friend fall prey to them, Nadine battles fiercely for her place in the ultra-competitive world of dance — only to reluctantly step away to please a man. 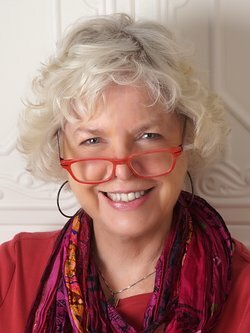 It takes the loving, mystical intervention of her beloved aunt back in South Carolina and an unexpected letter from a young girl to set Nadine’s chaotic life firmly on the path to fulfilment and the startling realization that every encounter and each choice is a milestone in the quest to forge her own destiny. Stephanie Austin Edwards, author of What We Set In Motion (2016), is a writing teacher, novelist and grant consultant.Her recent publications include a short story in the University of Texas literary journal, riverSedge, and an essay in the book Beaufort Through the Ages. In a past life, Stephanie was a costume supervisor on Broadway for productions of Dreamgirls, Grind, The Rink (Liza Minelli) and Woman of the Year (Lauren Bacall), among others. She has worked on The Cosby Show, the Woody Allen films Hannah and Her Sisters and Radio Days, and Michael Jackson’s BAD music video. She lives in the South Carolina Lowcountry, teaching writing workshops at the college level and working for the Beaufort School District as a grant consultant. 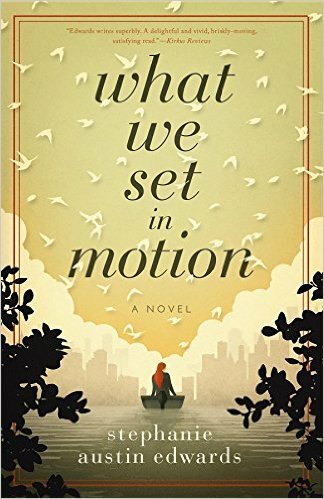 I wasn’t entirely certain what to expect when I was offered the chance to review Stephanie Austin Edwards’ novel What We Set In Motion, but I certainly was not disappointed. The voice Edwards gave to her protagonist Nadine feels like a mix between Anne Rivers Siddons and Nora Ephron – feminine, intelligent, sassy, and definitely Southern. I was hooked from the first page. While my favorite thing abut this novel was Nadine herself, and her story which blends low-country sass with uptown smarts, I enjoyed all aspects of this novel. The supporting characters all felt like characters you might have met in fishing camps or on city streets during the late sixties and early seventies, but slightly heightened, as if seen through the best of memories, which really worked for the story. Similarly, I thought Edwards’ descriptions of places was amazing. Granted a costume supervisor has to have a good eye, but her words made every location seem vivid and even cinematic. I felt the dolphin spray and saw every outfit. While I was a little concerned that this novel would feel a bit soap-opera-esque based on the drama and emotion in the first scene, but what I discovered was a well-written, compelling, thoroughly engaging story. Goes well with catfish and hush puppies, even though they have nothing to do with the novel.